The ideology of anger targets those most susceptible to it. This sermon was written by an ordained minister of the Universal Life Church. All ULC Ministers are invited to contribute their own sermons for consideration/publication. To do this, please email sermons@themonastery.org. We are lucky enough to live in a society which protects free speech. This is a wonderful freedom, but not one without consequences. The most obvious being that everyone has a voice – even those who use it to provoke extreme emotions such as hatred and anger. While many of us are guilty of lashing out from time to time, it is usually in a controlled environment. On the other hand, politicians, members of the media, and celebrities have vast amounts of exposure – when they act this way, everybody notices. This sermon will examine the nature of anger and its consequences in society. Hillary Clinton has implied that anyone who doesn’t support her is sexist. Donald Trump argues that building a wall on our southern border to keep immigrants out will make America great again. Bernie Sanders insists that if we throw all the Wall Street bankers in jail, the economy will finally be able to recover. Many of us are quick to poke holes in such one-dimensional logic. However, the ideology of anger targets those most susceptible to it – people who are frustrated with their current situation, fed up with their lot in life, or embittered by their own shortcomings. To them, blaming others is an easy solution. It doesn’t take much to set some people off. 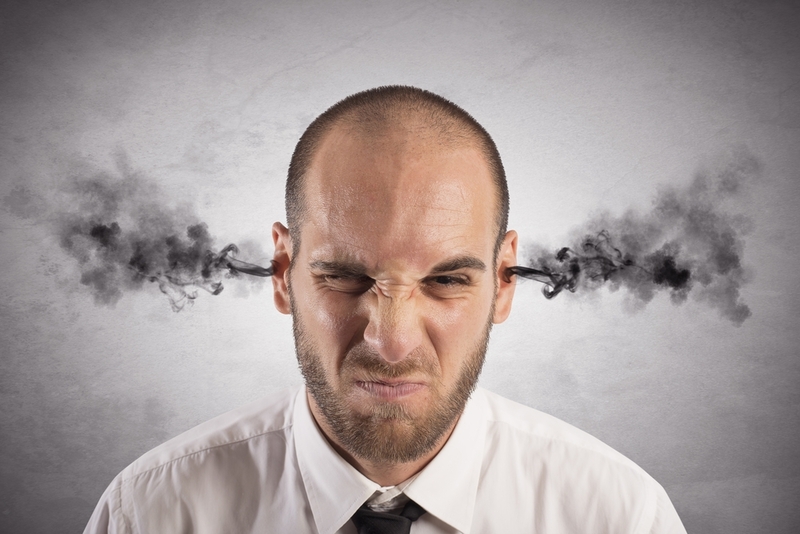 When we become angry our bodies release stress hormones, such as adrenaline and noradrenaline. Our brains then target the source of our anger, and we become focused on it. Our focus narrows to the point that we become obsessed, and soon we can see nothing else. It’s no wonder that people act irrationally when they are angry. Some religions permit certain types of anger. For example, the Bible considers “righteous indignation” to be an acceptable form of anger. However, Ephesians 4:26 provides a reminder: “In your anger do not sin”. The Bible holds that anger becomes sinful as soon as its focus gets shifted away from the larger problem and towards specific wrongdoers. Psalm 37:8 says: “refrain from anger, and forsake wrath! Fret not yourself; it tends only to evil. Those who propagate anger claim to have all the answers. They employ a unique brand of fiery language whose primary purpose is to inflame, not inform. When we are told that certain groups are the cause of our problems, our natural inclination is to direct anger towards them. But anger is a dangerous emotion, for it causes people to act in foolish ways. There is a reason for the saying “cooler heads prevail”. Anger as an ideology only threatens to divide us as a society. After all, we are so much stronger when we work together. What can we honestly accomplish by fighting amongst ourselves? Surely we can work towards a more virtuous goal than division. We have so much more in common than we have differences. To truly progress as a society, we must look past those things we disagree about and focus on working together to improve the collective good. We are all children of the same universe, we may as well act like it. We are headed for destruction of the United States as we no it now.death division descord among the brothers and destruction. Havent heard much of trumps discrimination of religion or racism and i do believe he isnt completely correct with these accusations, but i am impressed to hear someone is finally speaking out on the possibility of all this terrorist crap being organised from within America’s elite. The authors liberal bias is showing. By leaving out the adjectives illegal and terrorist from immigrant and Muslim, he makes all conservatives look like bigots. The best lies are ones that are buried in the truth. What? Donald Trump dares to call for actually enforcing our national borders and long existing immigration laws in order to stem what amounts to an economy crushing, politically base shifting foreign invasion? But such invasion has been fully sanctioned by our Elitist, One World Government type status quo of oligarchs, politicians and media types, amounting to yet one more “stand down” order from our so called leadership whereas politically driven selective law enforcement is the flavor of the day. For his public service, Donald Trump is being shouted down as “hateful” and “racist” by much of the mass “hysteria” media. There is a time for everything, including expressing anger. This is not expressive of a hate of people, but rather a rejection of what it is some people are doing. Trump has found enormous support and already managed to beat the long corrupted GOP/Republican Party at their own game by becoming the voice for patriotic citizens who are tired of being betrayed by a totally corrupt political system. To a slightly lesser extent Bernie Sanders has found similar support with Democrats and Independents against this same corruption which has totally taken over the DNC/Democratic Party. Unfortunately the DNC has a definitively elitist controlled, undemocratic stranglehold on that Party as well as having the mass media brain washers and a continual massive influx of quid pro quo driven cash from Wall Street and numerous despotic world leaders… all totally in the DNC tank. I hate lying and corruption. That makes me angry. There are LOTS of “me’s” currently angry, and for very good reason. And Hillary? Really? I begin to wonder which pile of FBI investigation files is larger? Is it the fully exploitable pile containing the J. Edgar Hoover style records on hundreds of members of the Washington power elite that Hillary “borrowed” the first time she was in the White House (no doubt since expanded) or is it the ever growing pile that the FBI is currently (reportedly) investigating on the many crimes of Bill and Hillary Clinton? Considering that various Clinton corruptions go back for decades perhaps their own FBI files rival “The Panama Papers” in volume and will take still more decades to sort out. What ever happened to the Panama Papers thing? Is the Clinton Foundation mentioned in there anywhere? But I digress. Isn’t politics great? Have a great day! What people are calling “Political Correctness” is no more than being civil towards one another. The people who have problems with that have many other problems. I too do not tell others who to vote for, but watching trump speak is like watching reruns of Archie Bunker. It was funny to an extent on television, but to think in someone who aspires to lead our nation it is sickening. Is this who we want our children to look up to? I will be the first to agree the other choices are not great, but look at his former butler, who is now his ‘historian’; advocating murder and insulting the president. What ever happened to respect? I do not insist you respect the president as a person if you have issues with him. The office of president of our nation is where the respect must be paid. The same people who disrespect Mr. Obama are the ones who follow a person who says nasty things about women, the handicapped and advocates violence. He defrauds individuals and encourages them to lie. He lies himself about the worth of his properties and cheats our children by not paying taxes to school districts. How do his followers think this is right? He excuse himself by saying, “that is what businessmen do”. I say that is what dishonest businessmen do. If we want our nation to be great, it is done by carrying your share of the load. Do what is right, not what you can get away with. Be a good person, do good things and don’t expect to be rewarded for them, do them because it is the right thing to do. God, karma, destiny will reward you. When you say you are going to do something, do it. Feel good about what you do and you will make a difference in other peoples lives. Integrity is a word that is out of date, especially in the political world, but I think it should make a come back. I can pretty well predict that in the event Hillary Clinton manages to escape justice (yet again) for what amounts to bribery and possibly even treason considering the well documented millions of dollars she has collected from and for support of many foreign interests and yet she still manages to become President, she will in no way represent any kind of “come back” of long missing integrity. The Clintons have both made a career long art form of turning political influence into cold, hard cash across many decades and both remain quite arrogant concerning their evident continuing immunity from criminal prosecution. There remains, as Al Gore pointed out, “No controlling legal authority” so long as it is they or their friends who are supposed to be that authority. If she gets elected, the corruption can only become much worse than evident today, and far worse than can even be imagined of Trump. No more cool aid for you Mr. Alexander. For the last fifty years I have seen the violence and nasty name name calling (reference Bill Maher calling Sarah Palin the ‘C-Word’ and ‘2 watt’ During His Stand-Up Act in 2011) coming from the Democratic party ( the party that still supports slavery). Remember Acorn trading crack for voter registration in 2008. And the Democratic Black Panthers threatening voters at the polls in 2012. Selective memory and revisionist history make you a Liberal. We are currently reminded that the victors write the history books as Hillary Clintons State Dept. just got caught deleting portions of briefing tapes that contradict their story. Was Jesus angry when he threw out the money lenders? I would like to add my vision of this matter by sharing with you some Divine revelations Scripture that will of course help folk of the world to change in some circumstances issues that pertaining others and not by themselves they can make it ;but by the willing of the Creator of all in a proper time willing by Himself. But us let only be a warner to people and leaders. So let focus on aims and means and let ask and wait for the comforter to guide us for what we or you have to share for helping your self and people of the earth and let focus on unite track by pointing our fingers in right direction. Attention! The original sermon has been edited since the first comment was posted. This makes most of the following posts look incoherent. The references to Mexicans, Muslims and the insinuations that all anger and violence during this election period is cause by Donald Trump has been removed. Shame on you administrators. Nice catch on the edit Mr. Vincent. I can’t blame the author for refreshing his work to better reflect reactions to it. Such is progress. 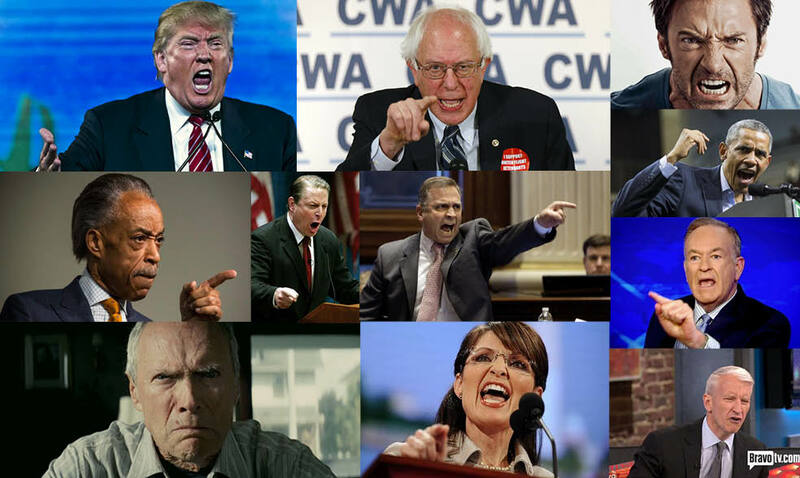 I am also freshly amused by the many various pictures of angry folks. Clint Eastwood is my fav. I hope to look that good some day. 😉 Humans are fun to watch, don’t you think? When our country is going down the tubes – we should be angry. Those who control their voice, control the conversation. Being new, there is a certain reluctance to speak, but that has never stopped me before. The concepts presented here are not new ones. Something is terribly wrong when over two years pass and no new data emerges or new concepts are revealed. Could it be our attention is not focused on the right topics? I tell my clients, by all means continue the same behaviors and expect a different result. Yes, God help us! That’s the entire point. It isn’t directly about making America great, building a wall, destroying the US Constitution and Bill of Rights, electing criminals to the White House and Legislature, or appointing new Supreme Court justices. It is about God. Before the Creation, God knew all, everything that would and will happen until the rnd of time. He knows the same of each and everyone onr of us. He has had eras to prepare. As we fuss and fuss about the details, God confidently holds us up in our trial. For in the end, it is going to be God’s will. His design, not ours. He tells us not to argue scripture, as He understands them and our arguing will not misdirect him. So, why all the hate, angry, violance an extremely unChristian behavior out of us now?. Yes, Jesus got angry with the money changers. That was not an arguement. He stopped a sinfulness, set the record straight, and moved on. No discussion. He preached quietly, intelligently, and peacefully before that day in the Temple. What this is about is God, a revival of God. And that, simplistic as it sounds, is the complexity of our path. Has not God affected every major event since the beginning of time? To my non-christian brothers and sisters, this is not to the exclusion of anyone’s faith path. It is simply the one I know and ascribe to. Other faith paths I am certain have their faith pillars.